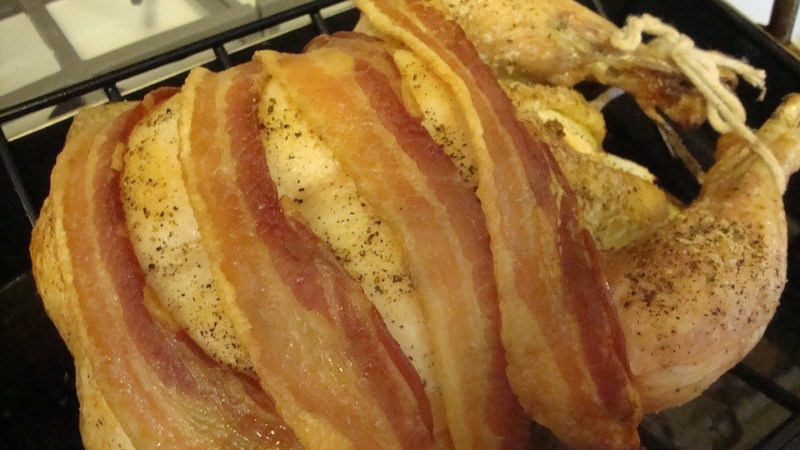 Bacon Roasted Chicken for Thankgiving? Why not? ﻿﻿﻿﻿I like my own Thanksgiving cooking. I always have. To say I make my favorite pumpkin pie is true. And I’m not ashamed. I make handmade, homemade yeast rolls. Every year. With butter. With white flour. 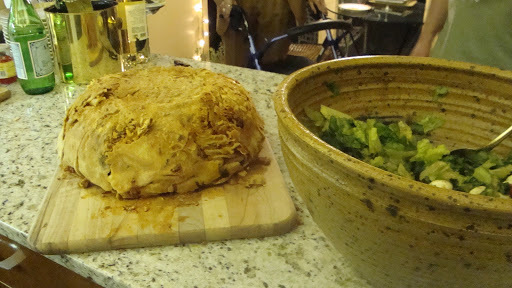 There are a couple of old vegetable casseroles that get brought out of the recipe attic…still. One is a Gratinee of Cauliflower from SILVER PALATE OR SILVER PALATE GOOD TIMES; I forget which. When I’m not home for Thanksgiving, I still have to make it and take it to my friend, Jeanne. She has to have it for Thanksgiving or sometime around there. Another is an ancient broccoli casserole from a friend in one of my first jobs out of college. (Michael Leventhal and National Trust for Historic Preservation, respectively.) Michael Leventhal, where are you? Another is a kind of yuck-looking, but great tasting spinach casserole that my son loved forever. Figure a kid who loved spinach. My dressing is mostly my mom’s, though I usually make another one that’s trendy (something with Grand Marnier and apricots out of BON APPETIT was one favorite) or something someone requests. If I have an east-coaster, they’ll tag me for oyster dressing. Southerners want corn bread whatever. 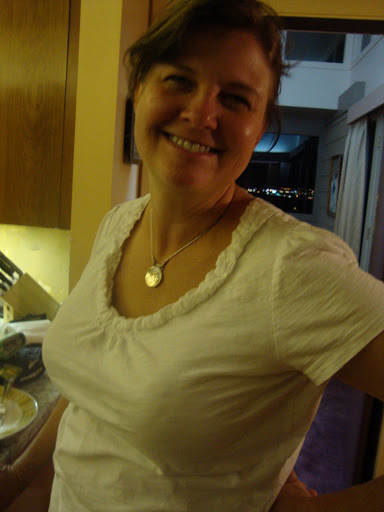 My mom had a big bowl on top of her refrigerator. 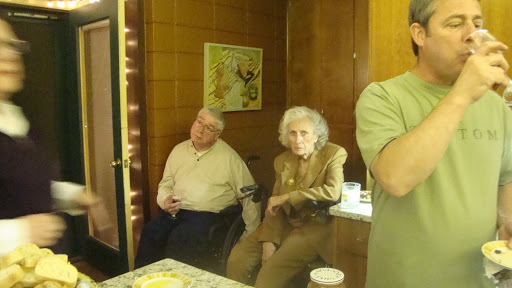 For a month or so before Thanksgiving (or whenever she was making turkey), she’d throw ends of breads and hardened edges of cornbread up there. By that Thursday, she had enough bread to make dressing. Sausage, celery, onions, an egg or two, salt, lots of black pepper, sage or poultry seasoning, broth that she cooked up using the neck, the gizzard and a few vegetables. What that woman couldn’t do with nothing. There was no recipe. Recipes were for wimps or for women with money for things like cookbooks and magazines. A woman with a brain could figure it out. This went without saying. 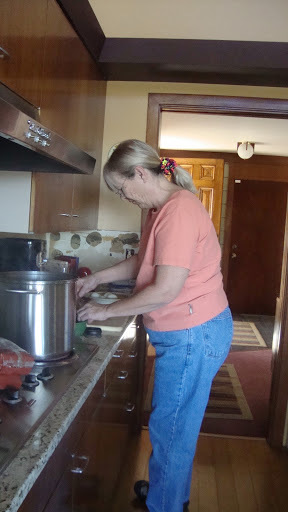 This year, I’m traveling to St. Paul to cook with Sue. 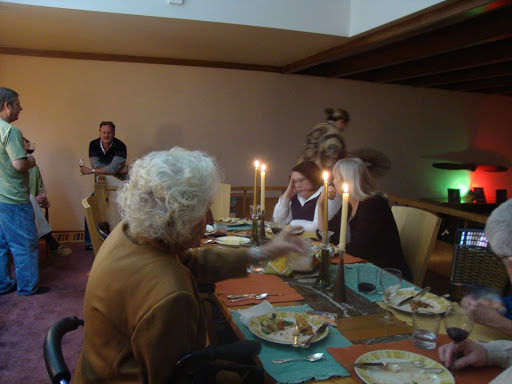 I think we’re going to do the quickie dinner I blogged last year called An Intimate Thanksgiving. You could do it, too. It’s not instant, but it’s not all day either. It doesn’t involve difficult gravies, stuffings or pies, but dotes on the essence of a holiday meal: one good main dish, something on the side to compliment it, a pretty table, and a couple of good bottles of wine. Want more stuff? If you had to, you could buy a pie. If I were in the Springs, and not baking, I’d order ahead (not much time) my pie from SMILEY’S downtown. Across from Poor Richard’s. Best breakfast in town, too. I’d then run down to La Baguette and beg a few rolls. IF I wanted a bigger meal, but still didn’t feel like cooking. I’d wine shop at Coaltrain and just throw myself on their mercy, though I’m sold on having three wines at Thanksgiving: an off-dry Riesling, a great Pinot Noir (Oregon), and a couple of bottles of bubbly of some sort. Everyone’s happy then, though you probably need soda, beer, iced tea, and juice or milk for the kiddoes if they’re present. Cranberry Bread from A CRANBERRY THANKGIVING. Make extra for breakfast and gifts. For recipe, click here. 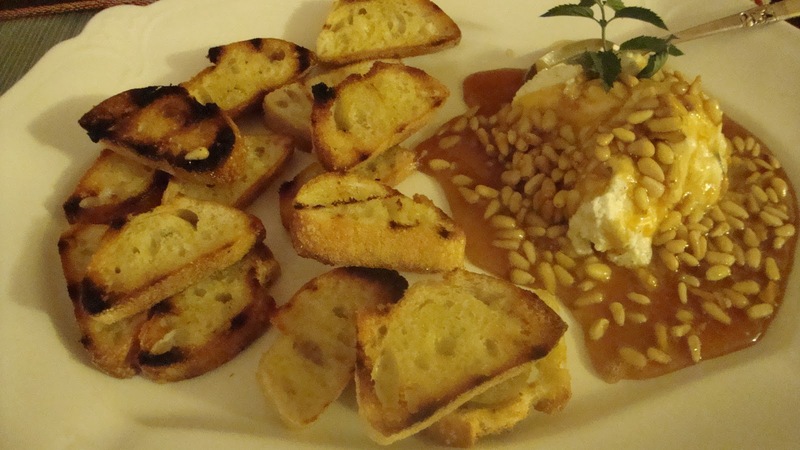 Starters: Nuts that must be cracked! A couple of different cheeses, crackers, grapes. Something crunchy like goldfish or tiny pretzels. 1. 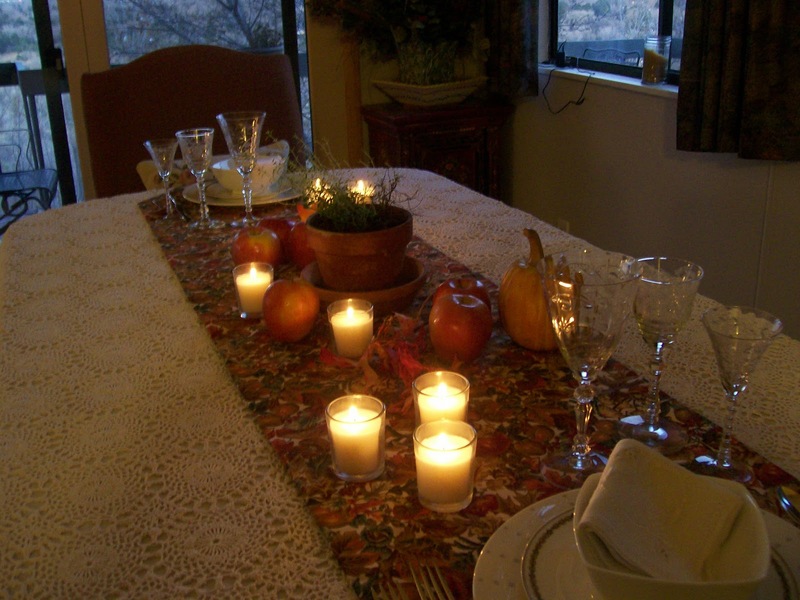 Set table the day before. Make it nice. You’re going to enjoy a good long while there. 2. Day before: Check your menu and make sure you have everything you need. Make a list and go to the store very early. 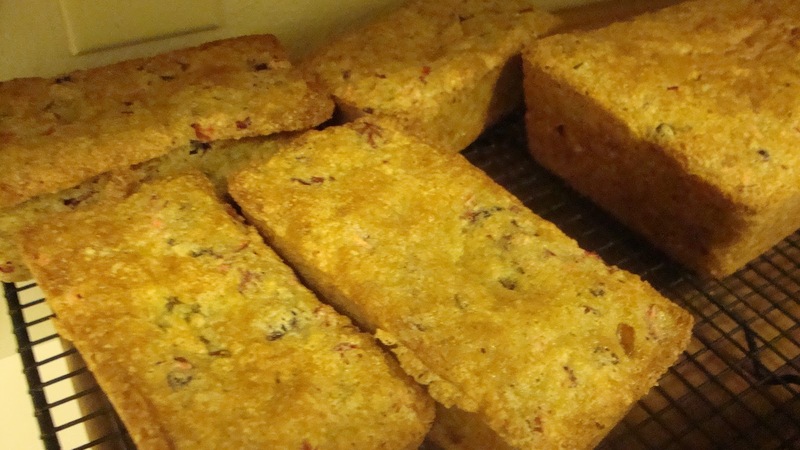 Make the cranberry bread (see below), wrap it well and store it at room temperature. 3. 2 Hours before Dinner time: Start the chicken. (Recipe below) It takes an hour and a half. While it cooks, make the potatoes and the beans. They can be covered on the counter and warmed right before you serve dinner. Make the pumpkin custards if you didn’t do it the night before. They’ll have to bake in the oven once you’ve turned the temperature down for the second phase of the roasting the chicken. 4. While chicken roasts: Uncork the red wine, place on table, and put the white wine and bubbly in the frig. Make a big pitcher of iced water and put that in the frig. 6. Take the chicken out of the oven and let it rest, covered, about 20 minutes. 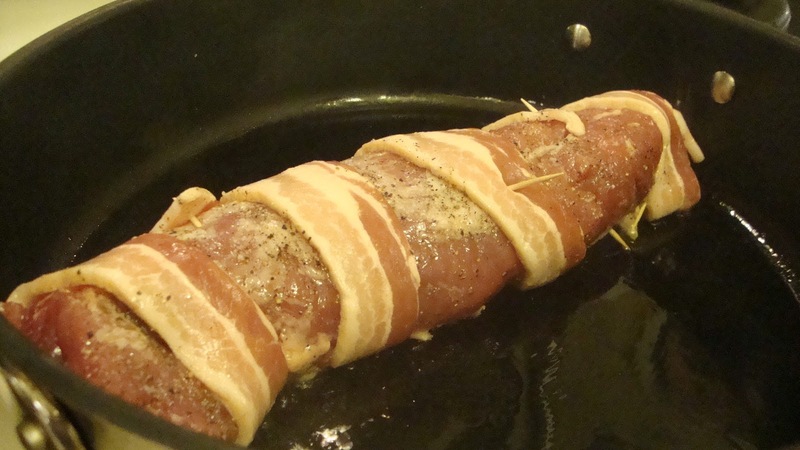 Make the gravy and warm up the other dishes. While someone else carves the chicken, get everything else to the table. You’ll be glad you only had another couple of dishes to serve by this time. Have someone else fill the water glasses; it’s an easy job and someone has to do it. Laugh if the gravy doesn’t cooperate. Do not, I repeat, do not cry. If it’s lumpy, put it in the blender or food processor, carefully. If it tastes greasy, you can add more flour (beaten with water), but probably you need to start over. Ditto for salty unless you just want to make a WHOLE lotta gravy. If all else fails, pass the butter with the potatoes or drag out a container of sour cream and pretend you didn’t want gravy. A jar of turkey gravy in the pantry might be a nice safety net. I have never tasted jarred gravy, but the endcaps full of it in the supermarket let me know it’s very popular. Heat it up, add some black pepper (I’m sure it needs something) and move on. Enjoy your lovely meal with friends or family. Smile often. Gee, that’s good. Give thanks…often. 7. Clear table and serve coffee. 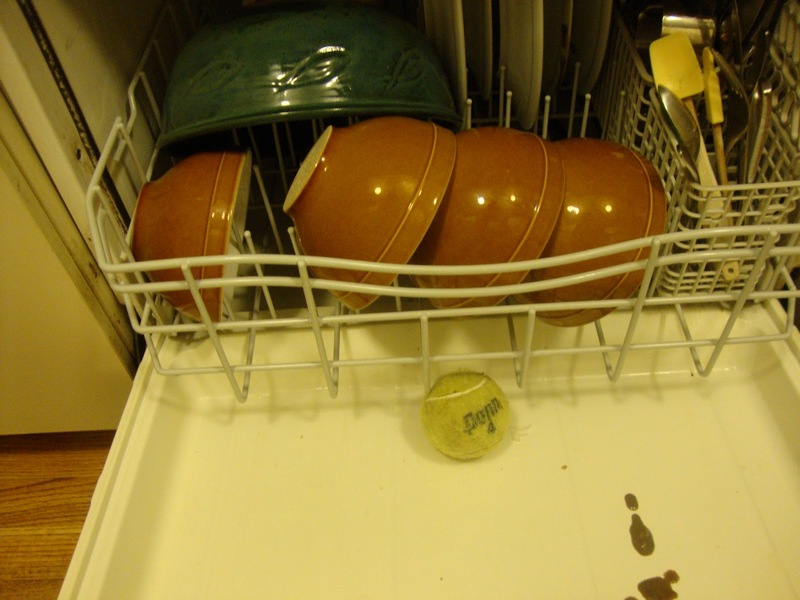 Let someone else do dishes. 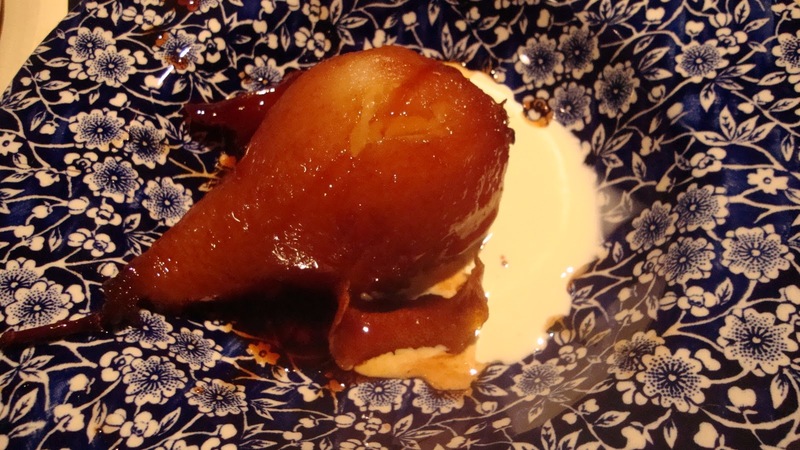 Serve pumpkin custard and a little more bubbly. Give thanks you did it. 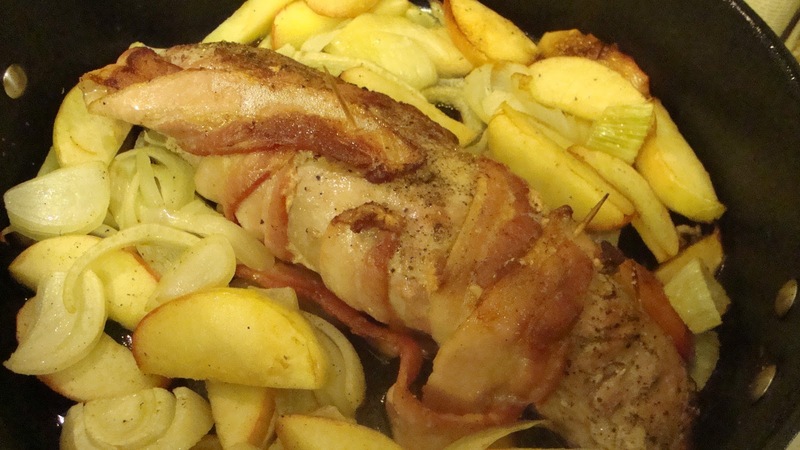 In a skillet, place about 4T drippings and fat from the bottom of the roasting pan. Salt and pepper it well and bring up the heat to about medium-high. 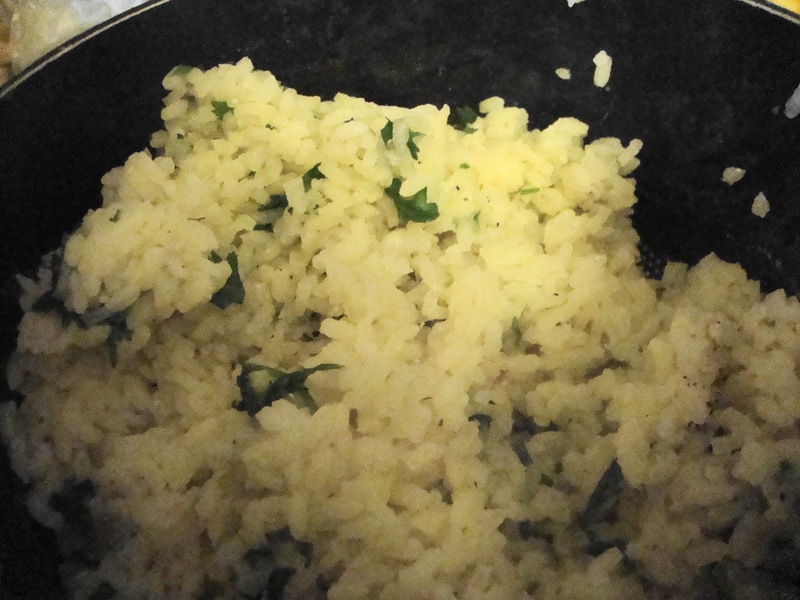 If desired, you can, at this point saute 1/2 c finely chopped onions for a few minutes until browned and softened. 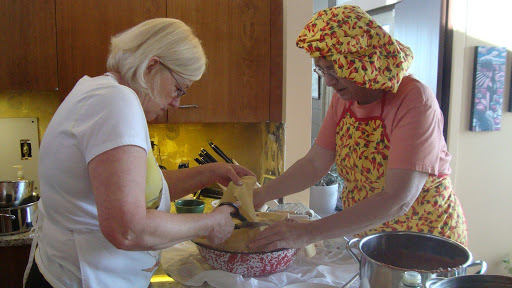 With a fork or whisk, “whisk” in about 3 T flour. Keep whisking and cook that flour for 2 minutes or so. Slowly add 1 1/2 cups chicken broth. Bring to a boil and cook for 3-5 minutes until thickened. Taste and adjust seasonings. If too thick, add some more broth or water. If too thin, whisk a tablespoon of flour into a 1/4 cup of water and drizzle that into the gravy, stirring all the while. Taste again and adjust seasonings. 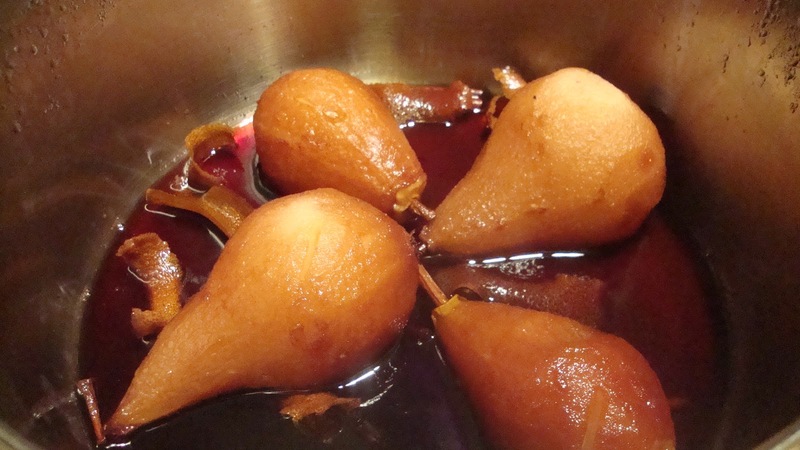 Add about a tablespoon of brandy, cook for one minute, and serve piping hot. This is the crux of Ina Garten’s chicken gravy that she uses for turkey when she’s just roasted a breast. She may have a written recipe for it; I don’t know. (I found it and linked it; it doesn’t read the same as my memory!) This is how I remember her talking about it and this is how I make it sometimes. It works and it’s darned good. If it just lacks something, try adding a few (careful) drops of hot sauce. 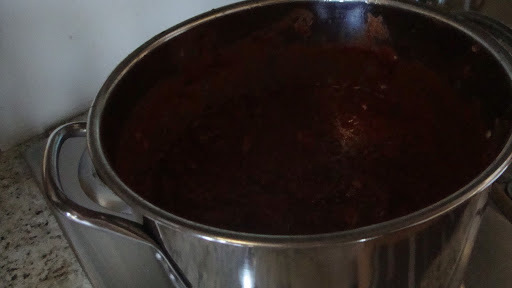 In fact, it’s worth freezing chicken drippings in order to have the fixings for this gravy whenever you want it. If you like pecans in your beans, toast 1/4 c chopped pecans in a small skillet on low for 10 minutes and set aside. Fill a 3-4 qt saucepan 2/3 full of salted, peppered water. Add a slivered large onion. Bring to a boil over high heat, covered, and add the cleaned and trimmed pound of green beans. (Haricots verts won’t need trimming.) Let cook 10-15 minutes until done, but a little crunchy in the middle. If you’d like them “grandma style,” continue cooking until as soft as you’d like. Drain and reserve until the chicken is done. To reheat, place beans and onions back in the saucepan with 2t butter and warm over medium heat until hot and bubbly, stirring occasionally. Taste and adjust seasonings. You can add a 1/4 c chopped, roasted pecans if you’d like. Serve hot. Fill a 4 qt small stockpot half full of well-salted and peppered water. Place 2 pounds of small, new red potatoes and 4 whole, peeled cloves of garlic in the water. Bring water and potatoes to a full boil and reduce a bit so water doesn’t boil over. Boil until tender, about fifteen minutes. Drain. Return to pan, add 2/3 c milk, 2T butter, 1 tsp kosher salt, 1/2 tsp freshly-ground pepper, and mash coarsely with a hand-held potato masher. Taste and adjust seasonings. Cover until chicken is done. Reheat on low heat, watching carefully, stirring, and adding a little more milk if needed. Here’s one of my versions w/ chocolate chips, baked in baby loaf pans for 30 minutes or so at 350 F.
1. You can leave out the raisins and use just 1 1/2 c cranberries. 2. 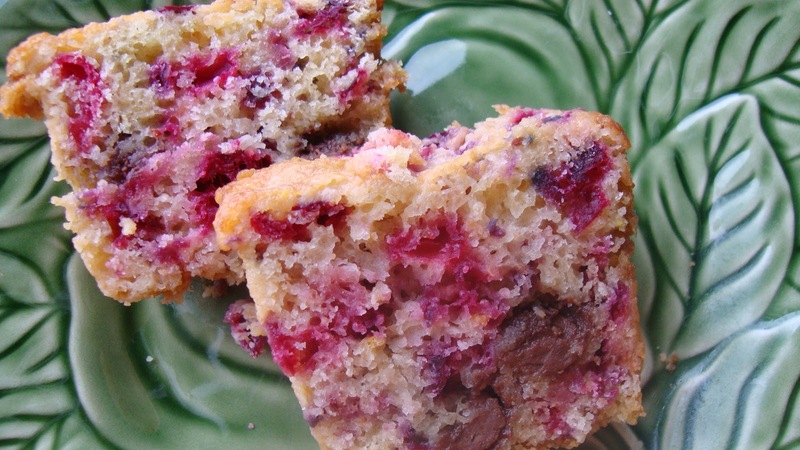 You can leave out the raisins and add 1/2 c milk chocolate chips. 3. Nuts? Up to you. 4. Very interesting: you can leave out the butter entirely and have a fat-free bread (with the exception of the fat with which you grease the pan.) Make sure you don’t overbake the fat free bread. I found this out by mistake!! 5. The recipe calls for 1t orange rind; I triple that to 1tablespoon. 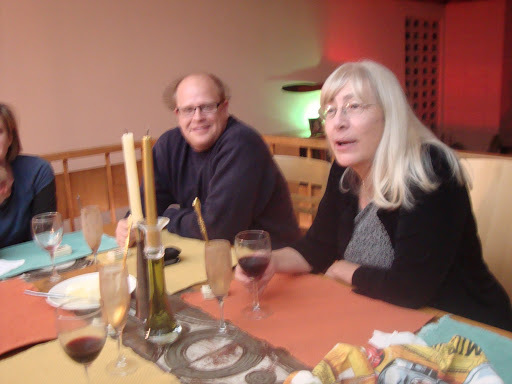 Blessings, my friends, as you do whatever you do for Thankgiving. We have a couple of friends who never cook, but always go to the movies! You Know You Love Chicken Basil, but Tell Me Why? You know how you have an addiction to certain Thai restaurants? (If you know why, let me know.) Now I like almost all things Thai foodie, except I can’t handle the tres, tres spicy dishes. “I like them; they don’t like me.” My father-in-law, Gene, says that, and he is so right. 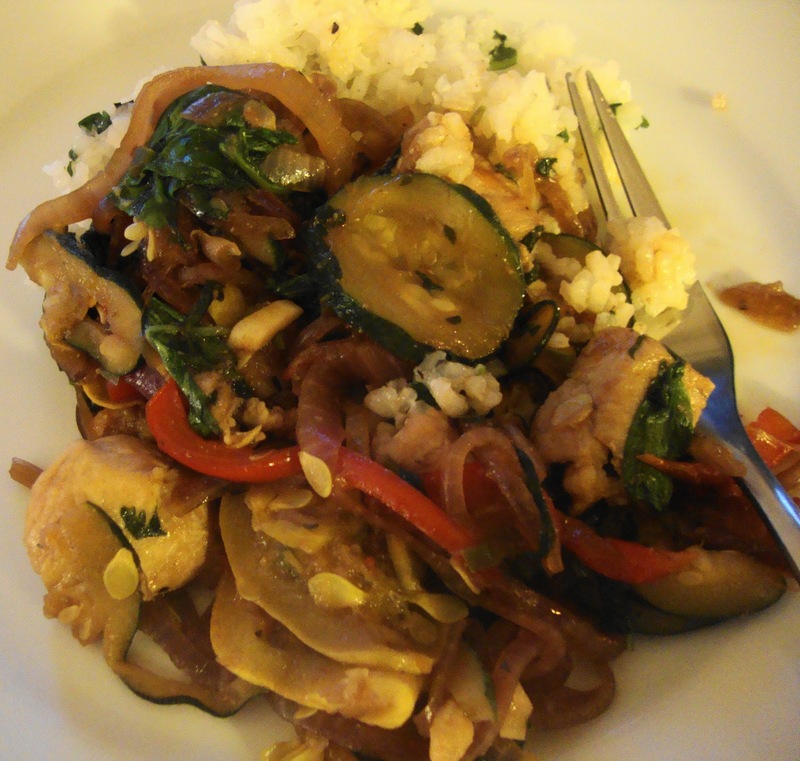 Ever since I came back from summer study at University of St. Thomas, I’ve been just dying to get into cooking Thai. For two summers, we lived above a Thai restaurant and I think it began to get into my pores. Here’s my Thai basil with regular basil. Planted in a pot under a shade tree. It’ll burn up in the Colorado sun otherwise. Finally, though, I kept looking at my Thai basil out by the whiskey barrel under the tree….and I knew its days were numbered. 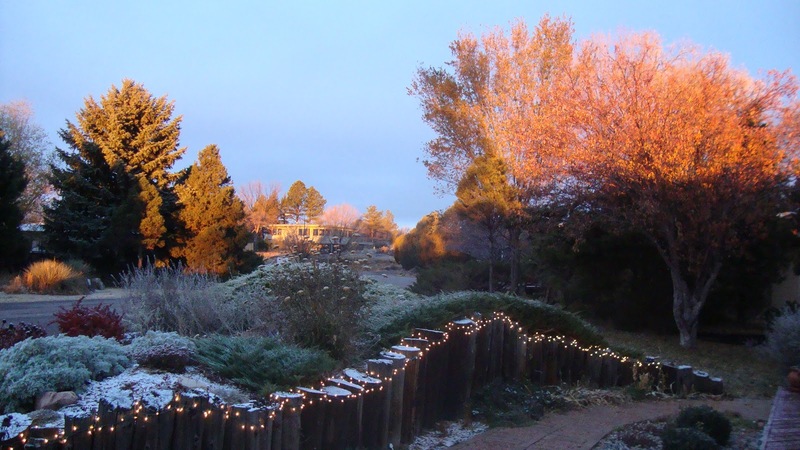 Not that fall is ever REALLY coming (and winter, true winter, only makes it a couple of times a year in the Springs, despite what others think), but we do get freezes. And herbs that haven’t been cosseted and lovingly brought in to my dining room south window bite the dust. Or whatever herbs do. (Sometimes they resurrect in the spring.) All told, it was time to get my Chicken Basil on. So google that and put it in your pan. There’s a million Chicken Basils. But most of them are almost all chicken. I sooo wanted a big bunch of veg in this one. And the one Thai cookbook I wanted to buy is out of print. Figure it out yourself, I said. You’re a cook; you’ve got the stuff. And here’s what I got. 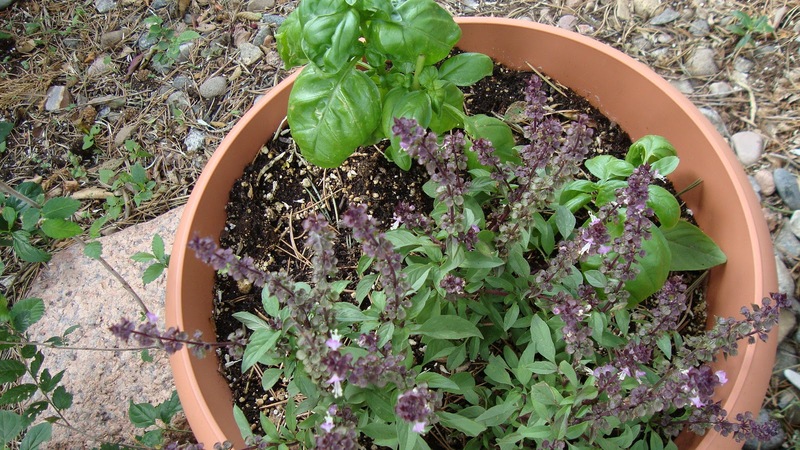 Do use fresh herbs; if you can’t do all three, don’t make it without at least the basil. I think that if you have the minty Thai basil, you could consider skipping the other two herbs, but I like it with all three. And, like everyone else, I’ll tell you to drink a little riesling with this. 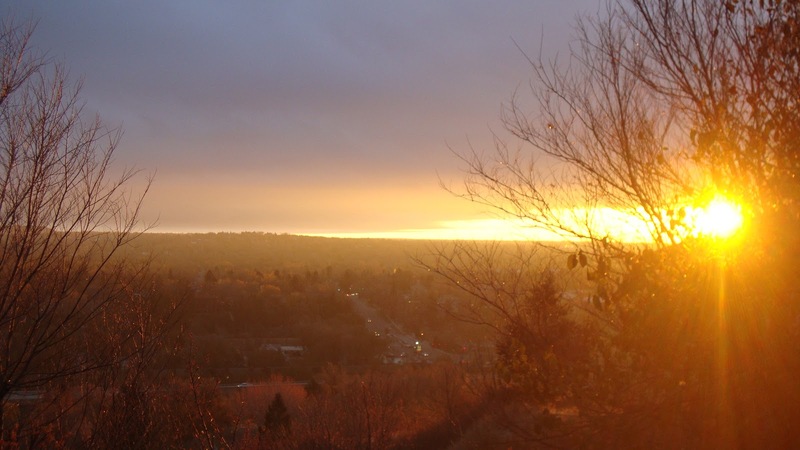 I do so like the Oregon ones… Chehalem in particular. They do a fairly dry one that’s just does my taster good. Set the table, pour the water or wine, etc. Then start to cook. 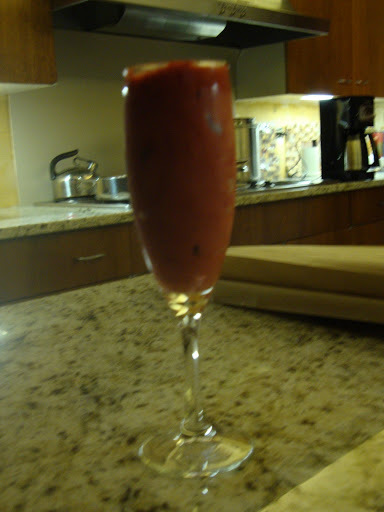 1 tomato, fresh, cut into quarters and squeezed to get juice and seeds out. Next, cut into medium dice. Have all this stuff ready to go. 2. 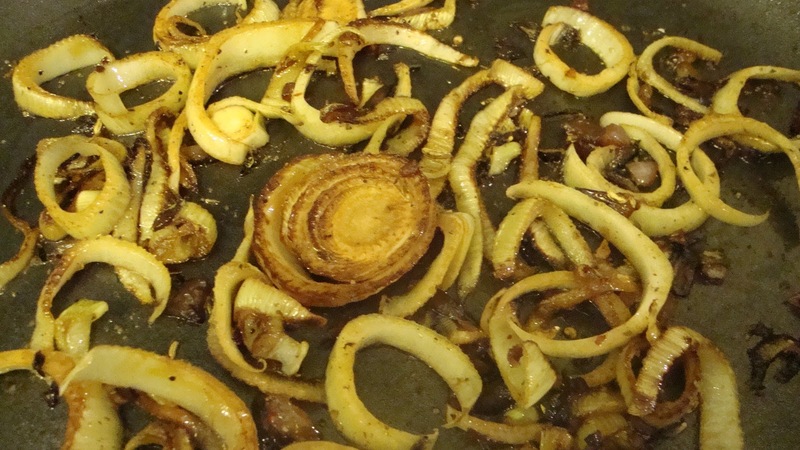 In a wok or large deep skillet, heat oil over medium high heat and cook sliced onions for about two minutes. 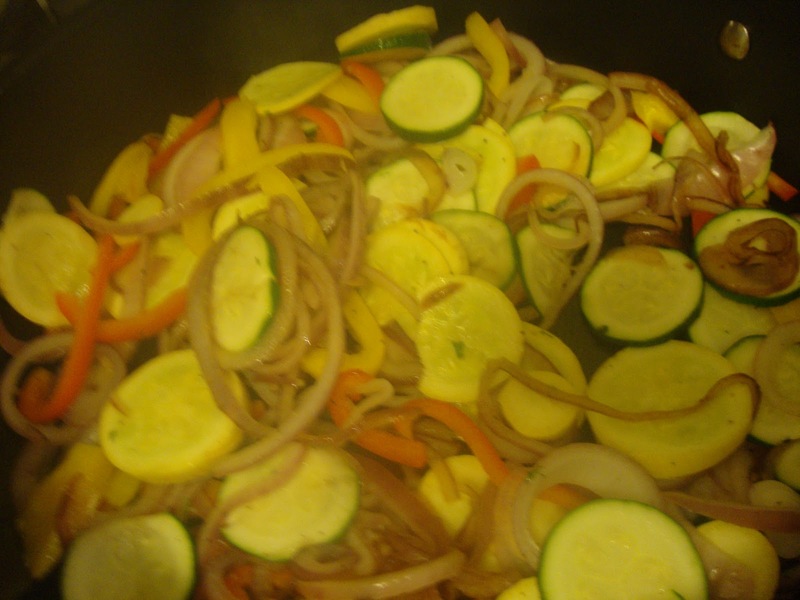 Add sliced garlic, squashes, sweet peppers, tomato and jalapeno. Let cook another two minutes, stirring often. 3. 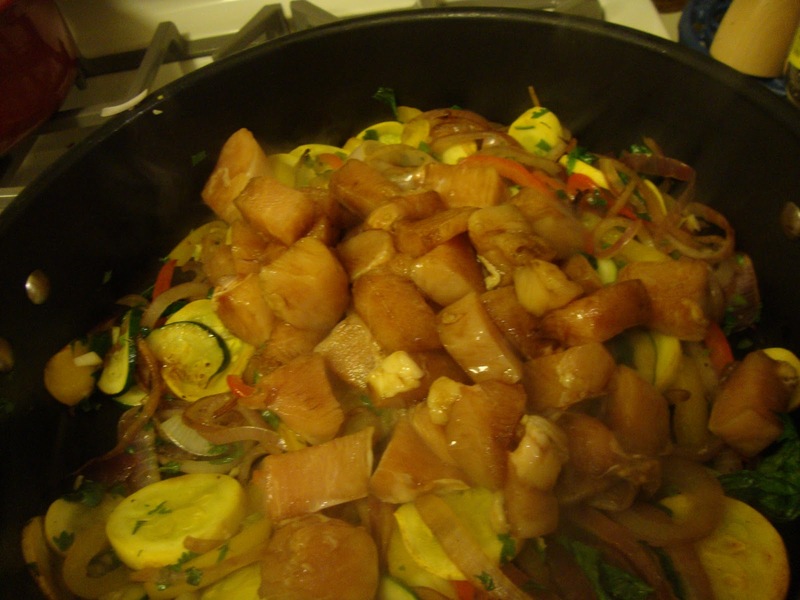 Using a slotted spoon, remove chicken from sauce and add to the pan of vegetables. Add half of the basil, the cilantro and the mint. Season well with black pepper. Cook about 3 minutes until chicken is no longer pink. Pour sauce into wok/pan and cook another 30 seconds or so, stirring all the while. Spoon in to serving bowl and top with remaining whole basil leaves. Serve with the hot rice. 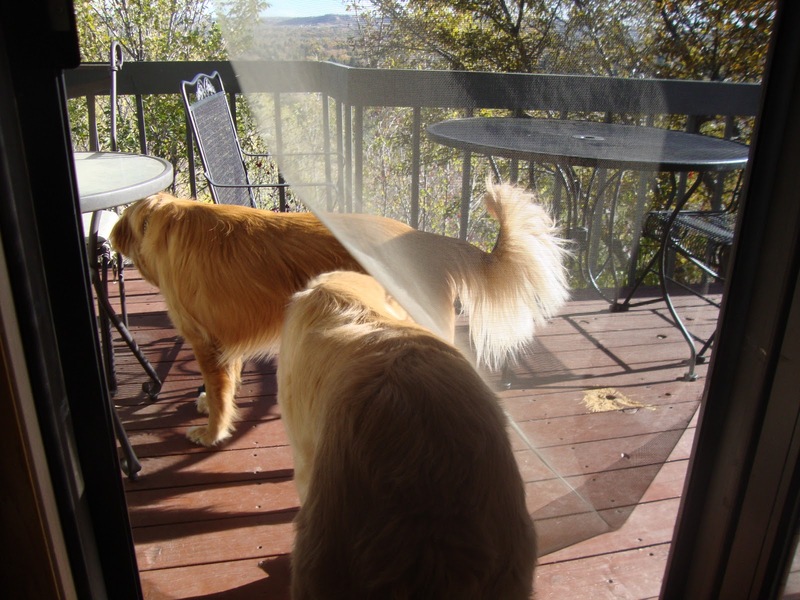 Still feeling like summer around here….Decks got painted over the last two weeks. This is what we call “The Doggie Door.” Still in the 60’s. Changing tomorrow. This week, I’m testing pizza and have already made some. 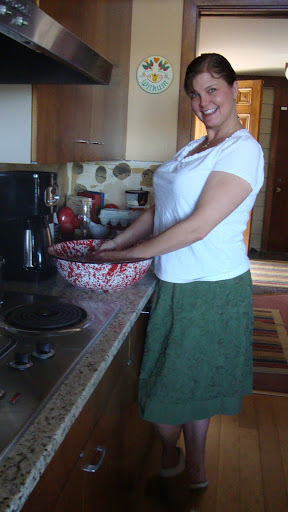 I teach the Italian section of “Cooking with Music” this Saturday and I WILL be up-to-date on my crust by then! Blog coming, I’ll hope. 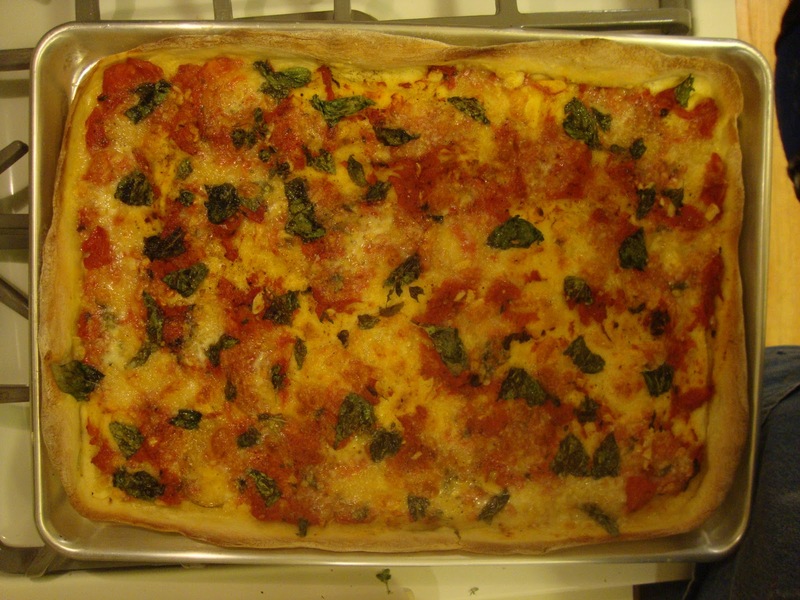 This is the first try at a 15″x13″ margherita. It had its ups and downs Cool thing about it is it’s baked in a half-sheet pan like anyone has. You could do it tomorrow! Fitness update: Gabby and I hiked the local hills instead of me going to the gym. 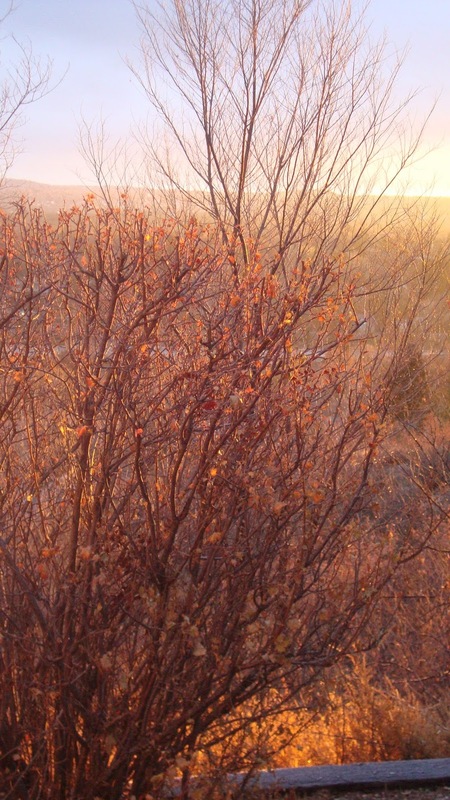 Spiritual practice of “putting one foot in front of the other,” as Barbara Brown Taylor says. 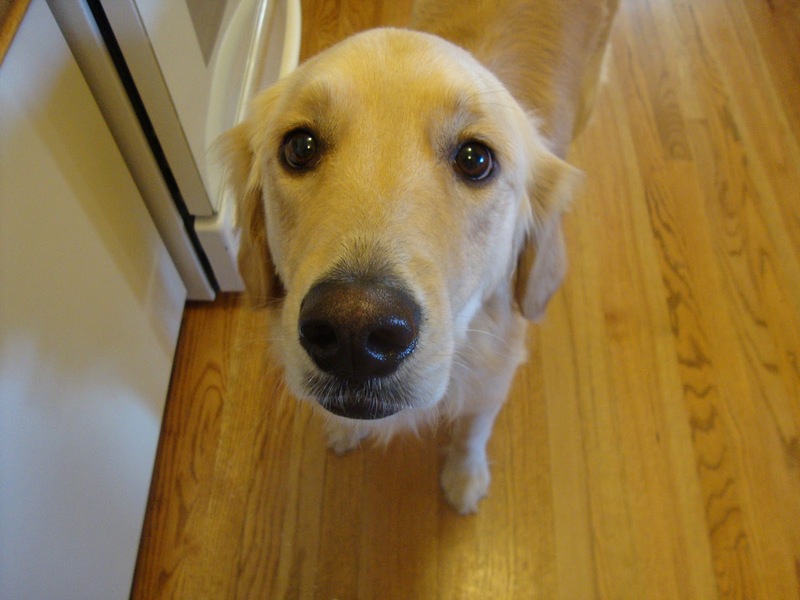 Dave and I worked out together on Saturday morning…before going out to breakfast. Gee. 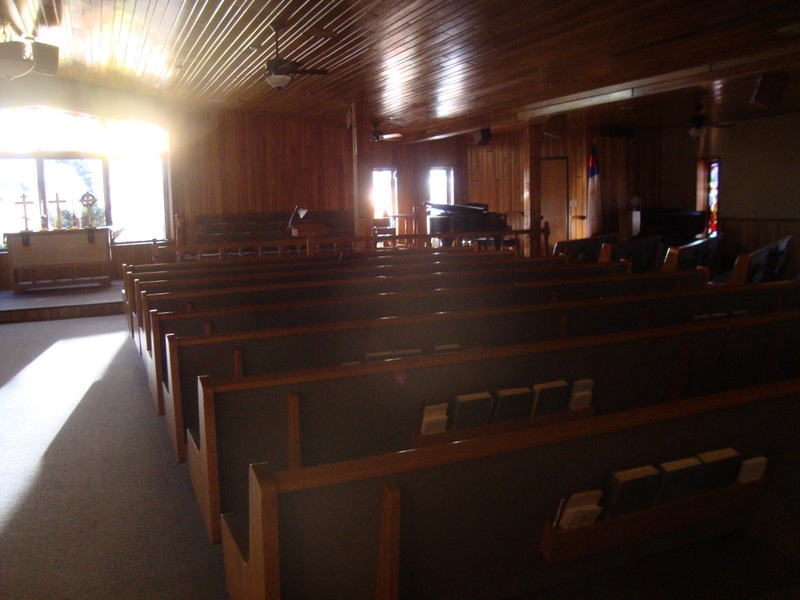 Here’s The Church at Woodmoor, where I’ve been worshiping and directing the choir lately. It’s a bit hard to photograph, but you get the idea. Lots of wood; interesting light. Loving singers and congregation. 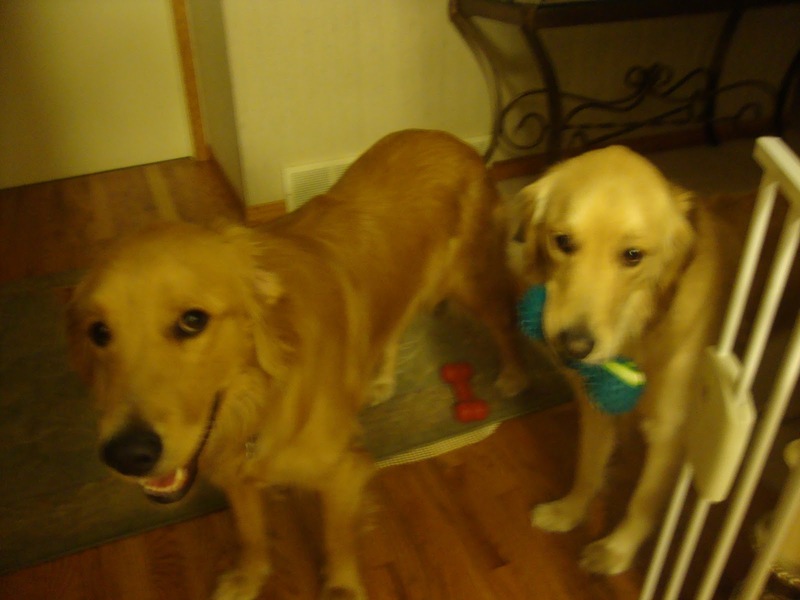 They’ve been very welcoming and I’ll miss them when I’m gone. I’m in the process of new job applications now. Today, I had to write my philosophy of music in worship. Good experience. Not as simple as it sounds. We’ll see. Living “Sing a New Song,” Alyce. 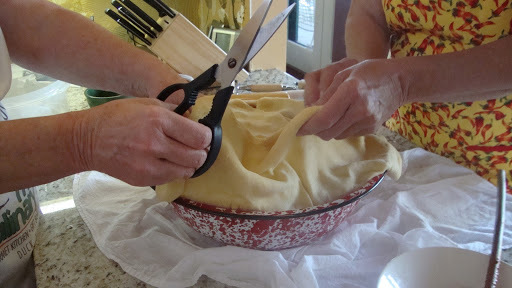 If you read my last post, you’ll know the ‘hood was getting ready to make the timpano. We had been talking about engaging in a BIG NIGHT for years. Somehow (ok, it was me) we never got around to it until next-door-neighbor Sara ordered the pan and got us on the road to very full tummies. We invited other neighbors and friends and set to work. 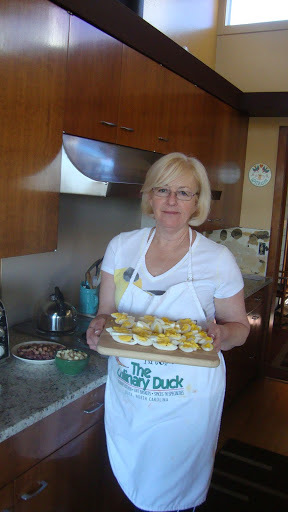 By Friday, thanks to Sara, the pan was ready, the sauce was cooking, the sausage was fried up, and the eggs were boiled. 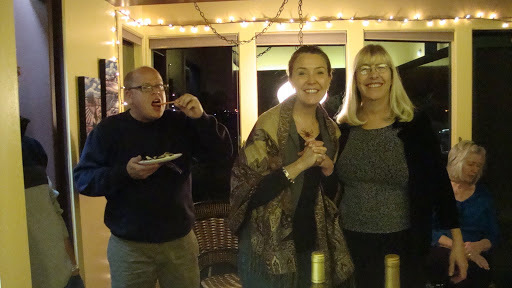 MaryPat and I were in charge of buying wine and making antipasti. Marylu was doing the dessert. Others: eating was their job. Eating and watching the movie. And having a BIG NIGHT. If you’ve never heard of a timpano (Italian for timpani–it’s shaped like a drum) before, it’s an entree for an army that’s cooked up in the movie, “The Big Night,” (1996) starring Tony Shaloub, Stanley Tucci, Isabella Rossellini, Minnie Driver, Marc Anthony, etc. I do not know if this dish was made up for the movie; it could have been. The premise of the movie is as follows: two Italian Brothers (Primo-chef and Secondo-restaurant waiter, manager, host, etc) open a restaurant that just doesn’t seem to be making it. The red sauce, cheapa– place down the street (owned by a dubiously friendly guy) makes a bundle. Why not Primo and Secondo? In order to pay the bank and secure their future, they decide to plan and execute the party to end all parties. (The Big Night) Louis Prima will come and sing; he’s the fine friend of the dubious red saucer. Right. 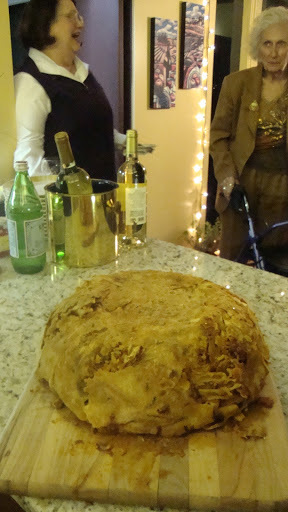 The party will have all kinds of food, but the piece de resistance will be the timpano, a big layered entree (pasta, meat, cheese, eggs) that fills a washtub and is surrounded by a thin, crispy crust much like a pizza crust. (In the movie, the timpano is actually a primi-or first course.) Even Primo, great chef that he is, isn’t sure when this mother is done. Well, of course it gets done; in fact, he makes TWO of them. One is for Louis Prima. I won’t spoil the movie for you, but this cult classic will turn your tastebuds and twirl your fancy. 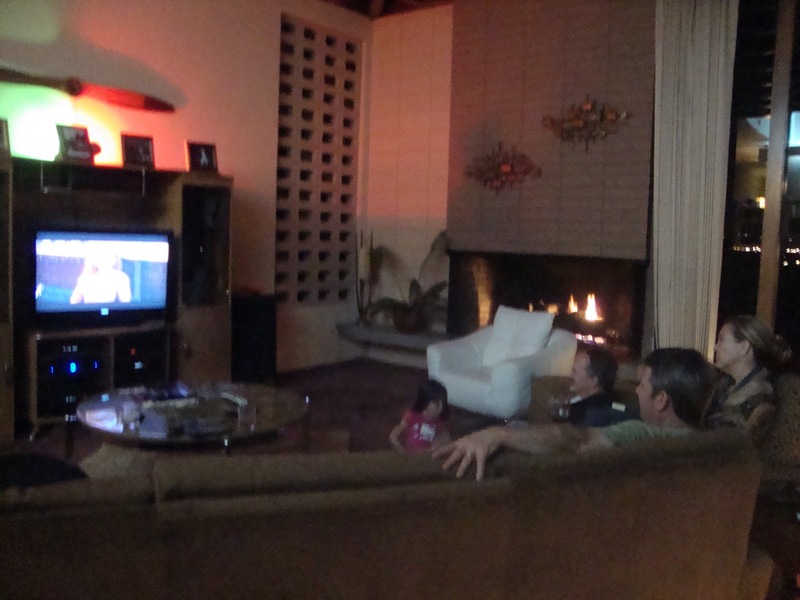 It may even encourage you to plan a “Big Night” for yourselves and your friends like we did. If you don’t want to make timpano, order pizza and pasta from the local red sauce place (!) and do it anyway. First, the sauce. Sauce cooking, cooking, cooking. Lotssasauce. Started night before. Next: more shopping and then chopping..cheese, meats, boiled eggs. About 3pm. 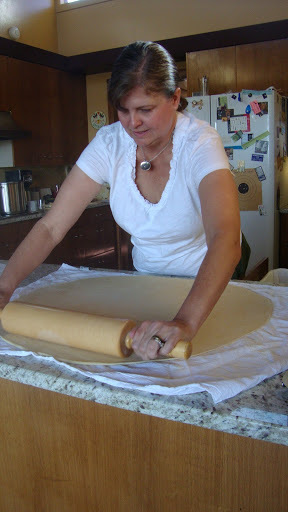 Dough: getting started rolling and taking turns. It must be 1/16″ thick. It starts with four c flour, salt, olive oil and water. 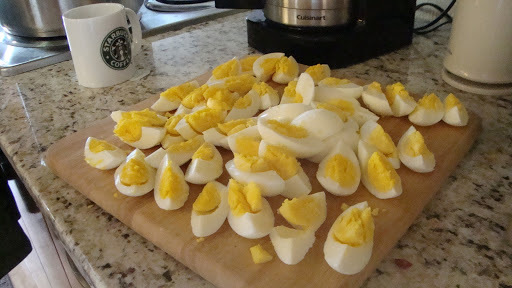 Boiled eggs: 16 of them. One more part ready. 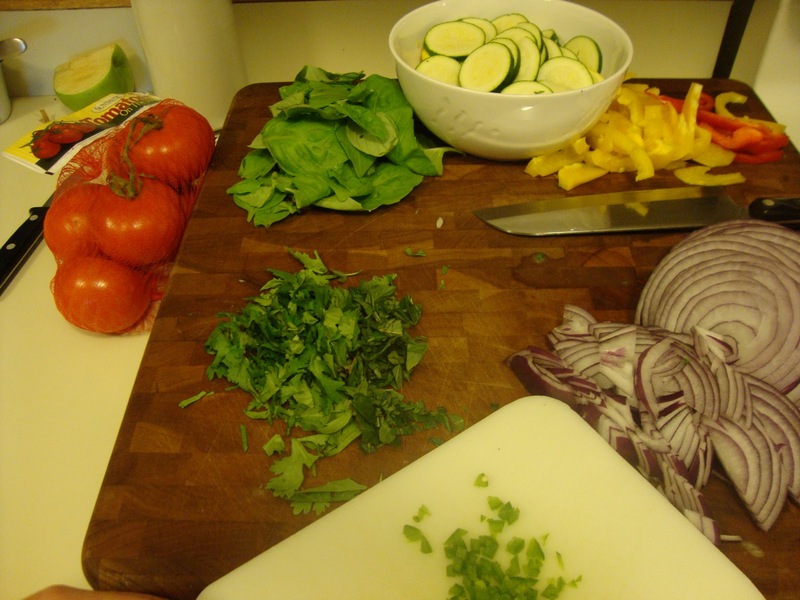 Mise en place–getting some of the meat together, too while someone else rolls dough. Meatballs, Genoa salami, Italian sausage. Lots of chef snacks. No wine, though. I drank tea. The recipe suggest drinking all the way through this process; I thought not. 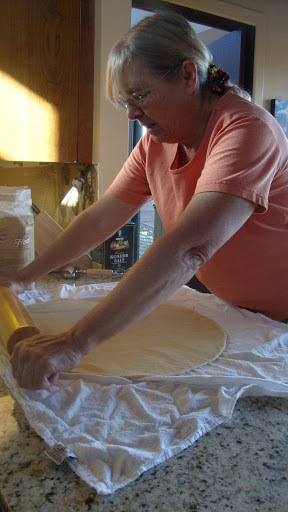 Getting going on the dough: you can do it if you try eye… rolling dough on floured cloth. Oven preheated. Pan at side–ready. Keep rolling; it’s not big enough. Your turn. Arms tiring. 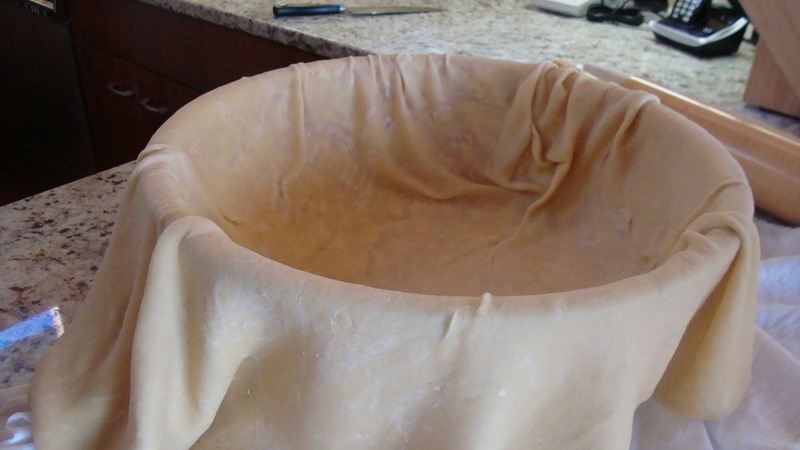 The dough… a lot of rolling paying off. Let it rest. Let us rest. 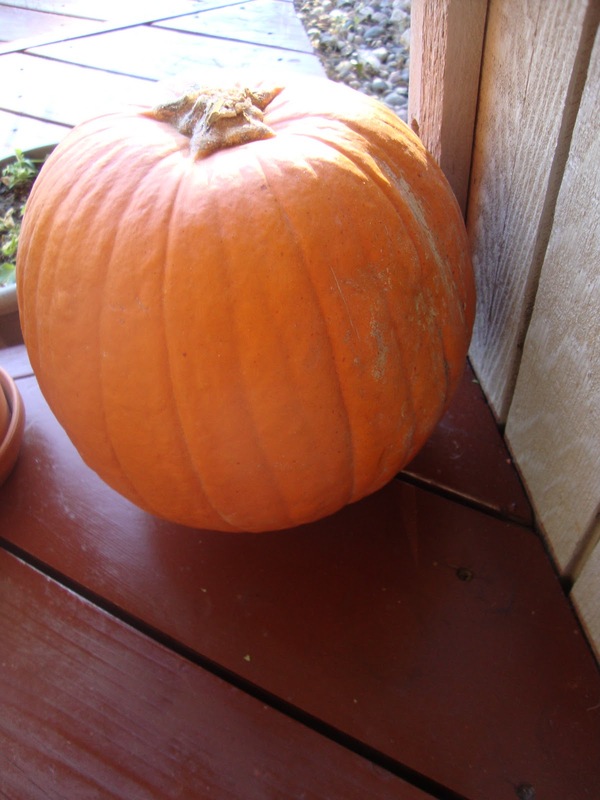 It’s about 36″ in diameter and 1/16″ thick. Will it come off the (floured) towel or stick? Chef Mary Pat and the pan that would never be filled? Bringing the layers to the counter for the mise en place–having everything ready to go before we begin layering into the dough. The dough. The pan. The beauty of it all. This is really going to happen. Is it? We’re still wondering… There’s only one big problem. We forgot to grease the pan. That’s right. Though I didn’t remember that until I was putting the antipasti platters together. I didn’t tell Sara til after it was done and I didn’t tell MaryPat until right before we tried to get it out of the pan. Read on. Brave, now: layers of pasta and sauce, meats and boiled eggs. How many layers, how deep? Talk, talk. Don’t make it too full. Needless to say, a lot of cooks could have spoiled the broth, but we kept at it. We are still friends. One person read the recipe; two filled the dough. Those at home prayed. It’s full. It’s full!!!! Now the dough must be completely sealed. Fold, fold. Don’t pull. You don’t want holes. Cut and trim. And you do this how with the dough? No double layers allowed. Trim excess. Into the oven, ready or not. Happy. Tired. 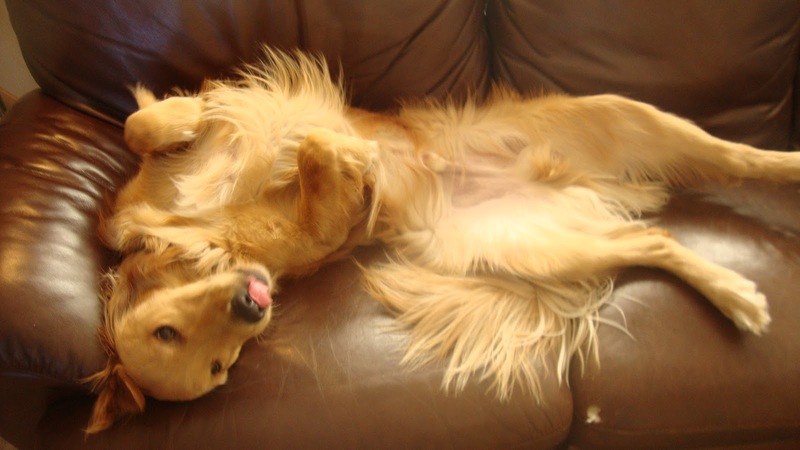 How about a nap? Oh, the antipasti must be fixed. It’s near 5pm now. People are coming at 6:30. In the meantime, Dave is at home grilling and running out of propane. He ends up grilling the veg on the camp stove. So much for the big gas Weber we bought for Father’s Day. You actually have to remember to buy a tank of propane once in a while. My advice about keeping an extra container have gone unheeded. Of course, where would you store THAT sucker? Dave has also run to Marigold for baguette. Who wants pasta without bread? I know. 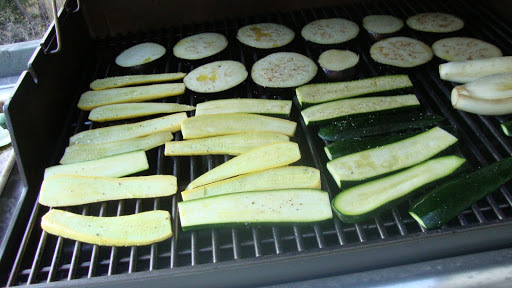 Grilling vegetables for antipasti…gotter done. Baby bok choy, mushrooms, endive, squash, eggplant, etc. Fennel sauteed with onions and garlic and white wine… to garnish the veg platter…and to eat!!! Love fennel. Dressed up for timpano, a friend arrives early to help. Meat and cheese antipasti-proscuitto, soppressata, mortadella, provolone, pepperoni-garnished with artichokes, olives, and a sugar pumpkin I’ll later fill with pumpkin soup. Grilled vegetables with aioli…yum. Fennel fronds at right edge for garnish. Dave does the ferrying back and forth to the neighbors’. Little friend goes along to open doors. When we arrive-finally-the timpano has been deemed done and TA DA!!! It’s out; it’s out.. Look at that. (Is it done? How do we know?) But now we wait. It must cool; it you cut it now it will splat all over. One more bite of vegetables while we wait. One more sip of wine…while we wait. While it cools. It’s not ready? It’s looking readier; Dave banged it out of the pan (phew) Salad’s good to go. Ready for its closeup. Hope it tastes better than it looks. It’s awesome, though. Still waiting…. Look at that thing! How much longer? 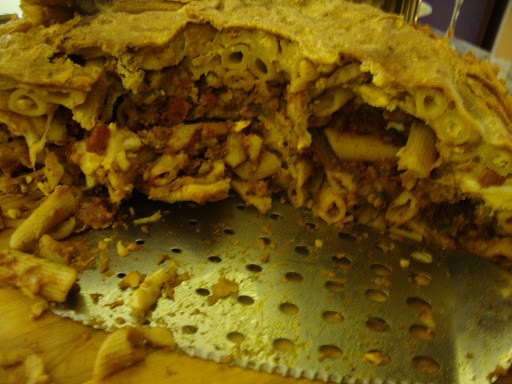 And.. here it is, folks…inside the timpano. Mike does the initial surgery. Sara-happy. We did it! We did it! 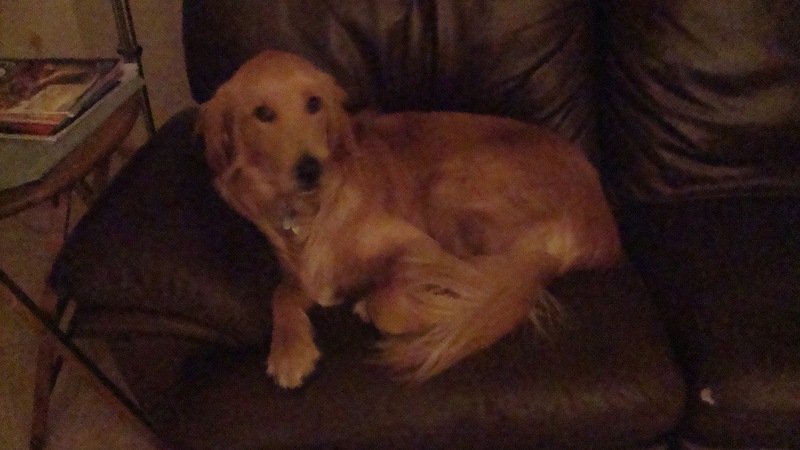 But we have to watch the movie, too. It worked. Eat a little; watch a little; drink a little. A last glass of wine. Dessert via Marylu: each stem a different flavor of gelato. Movie’s over. Time to clean up. Ah, gee. 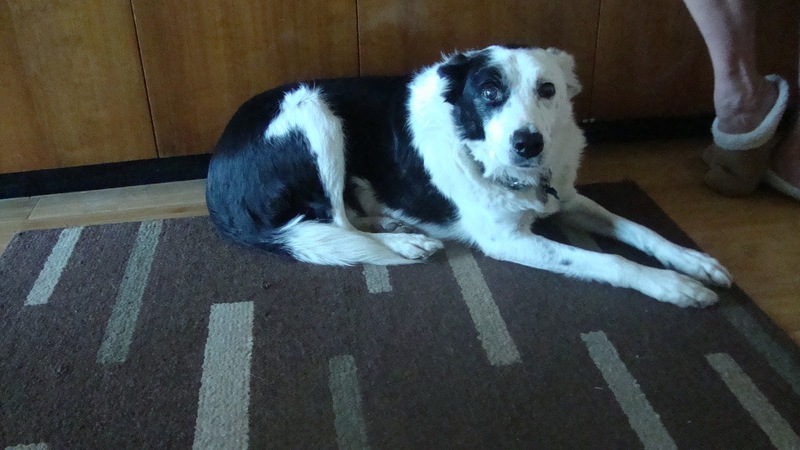 This was a one-dog kitchen project: Moss, aka Timpano Dog…kept us company throughout. Actually, he just was praying we’d drop stuff. Of course, we did. You might want to try the second crust. While the recipe worked very well and the process is excellently documented, my overall impression was that it could have used more moisture (more sauce/more beaten egg?) and that the layers were too jumbled to be viewed truly as layers. For example, the salami layer: I think there were 2 cups? of salami. Unless you doubled that or tripled that, the salami just melted into the pasta or eggs below. You needed a fair amount more in a layer for it to TURN OUT like a layer or like the layers in the movie’s timpano. Just a thought. Same thing with other meats, but I wouldn’t increase the boiled eggs too much. “Have the courage of your convictions” when you cook it, but mostly when you turn that thing out of the pan!